When the laborers are many, we cover an immense amount of field! 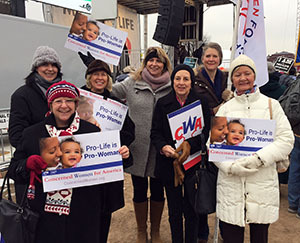 This past Life Week, Concerned Women for America (CWA) and Young Women for America (YWA) advocated for women and the unborn across the United States. While rallies were booming around the nation, our CWA of Texas ladies held a more somber event in the south. At the very place where Roe v. Wade was taken up at the Texas State Court, prayers were offered up to the Creator on behalf of women and the unborn. Where the words “freedom to choose death” once echoed, in their place were the hallowed murmurs of God’s people beseeching Him to protect life. Redeeming the beginning of one of our darkest decisions in American history, our CWA of Texas ladies held a prayer vigil in the exact location of the verdict and honored God through their prayers. On the West Coast, staff member Sara Olson attended the San Francisco Walk for Life and was joined by CWA Northern California Area Director Patricia Del’Marmol and our YWA President of Placer County, Carissa Campbell. You’ll notice that in the photos the pro-lifers were met by a small group of hostile protestors, but the Walk attendees eclipsed them with their amazing number and stalwart passion! Preceding the walk, Patricia hosted a booth where she was able to discuss with attendees the importance of protecting women and the unborn and share how they can get involved with CWA. 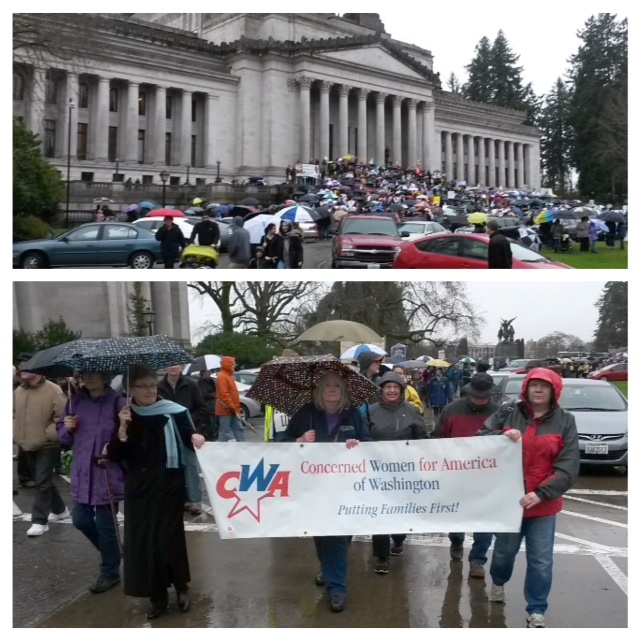 Rain didn’t stop the CWA of Washington members from marching with thousands of other pro-life citizens to the Capitol to deliver their message to Washington legislators. 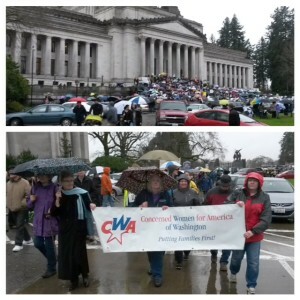 Check it out … the umbrellas packed the steps to the Capitol! 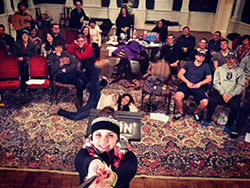 In Arkansas, Lyon College YWA President Devyn Young co-led a prayer vigil and worship night. The young women and men in attendance thought the best way to protect the voiceless was to use their voices in prayer to our Creator. 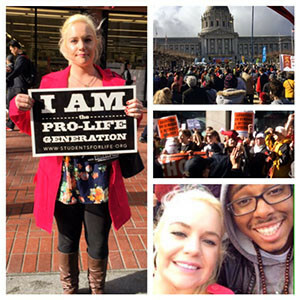 Then, over in Louisiana, State Director Sancha Smith had the opportunity to share her testimony at the Louisiana March for Life. She told about how, for her, abortion is personal. She shared the Gospel of Jesus Christ and how the Lord has unequivocally changed her life. Her vulnerability and boldness impacted the multitudes that were there for the March. Up north in Ohio, Madison Gesiotto, YWA President at The Ohio State University and former Miss Ohio, was asked to tell her story at the Ohio Right to Life event. She told of how she received major pushback for her recent article in The Washington Times stating that abortion is the number one killer of African-Americans. She relayed her message to the crowd that she refused to retract her advocacy for the unborn or back down on her faith convictions. 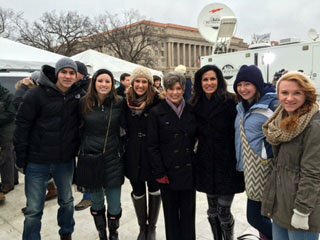 Last but certainly not least, not even a blizzard could stop our National staff as well as some state leaders from attending the March for Life events in Washington, D.C.! 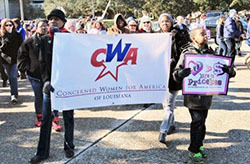 While our “Pro-Life is Pro-Woman Brunch and Lobby Day” was affected by office closures due to the inclement weather, CWA and YWA staff still marched to the Capitol and rallied on behalf of our 500,000 members nationwide. With snowflakes beginning to fall, the faithful crowd (large, considering) walked with purpose and passion, advocating for all parties that abortion harms. 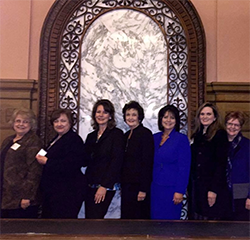 Directors and members braved the weather and represented states like Florida, Georgia, North Dakota, and Texas. 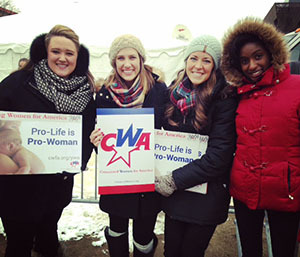 These are just a few examples of the enormous impact that CWA is having on the pro-life movement in America. It is our prayer that we will see the end of abortion in our lifetime, and thanks to the prayer and action of our staff, members, and amazing donors … we very well just might! Thank you for standing with us to defend life.